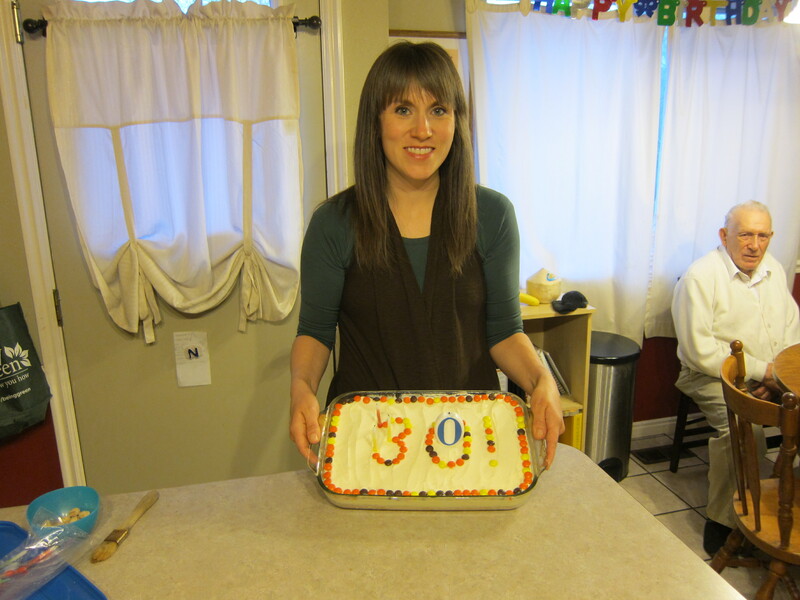 I was all set and ready to do a continuation on my Indian food post from last week, but then I had a birthday and I turned 30 which is kind of a monumental number and so I thought instead I’d share what we ate for my birthday dinner along with a couple of pictures from my birthday. By the way, though the dinner was healthy, the dessert was was so not. It was an ice cream cake. But we shared between 8 of us and I try to keep it real most of the time which is important. I asked my hubby to make my pizza recipe for my birthday dinner because: 1.) the whole family loves it and I wanted happy people around my birthday table 2.) it’s healthy yet more of a party food 3.) my parents were visiting from Seattle and my mom is vegan and this is an easy one to make a delicious vegan version…I just took a section of the pizza and omitted the cheese and added a variety of sauteed veggies like bell peppers, onions, artichoke hearts etc. (didn’t saute the marinated artichoke hearts). This is a recipe I have shared before, but I’ve recently updated it with a few small changes. So go here and try it yourself! And if you can find Izze drinks to go with it, your family will love you! Izze drinks are a sparkling juice that is naturally sweet; our Costco sells them and they’re a great alternative to soda. My other birthday request was that my hubby take down the old blinds in the living room and put up drapes that I purchased just prior. He did. And I love them. And him. See here they are! 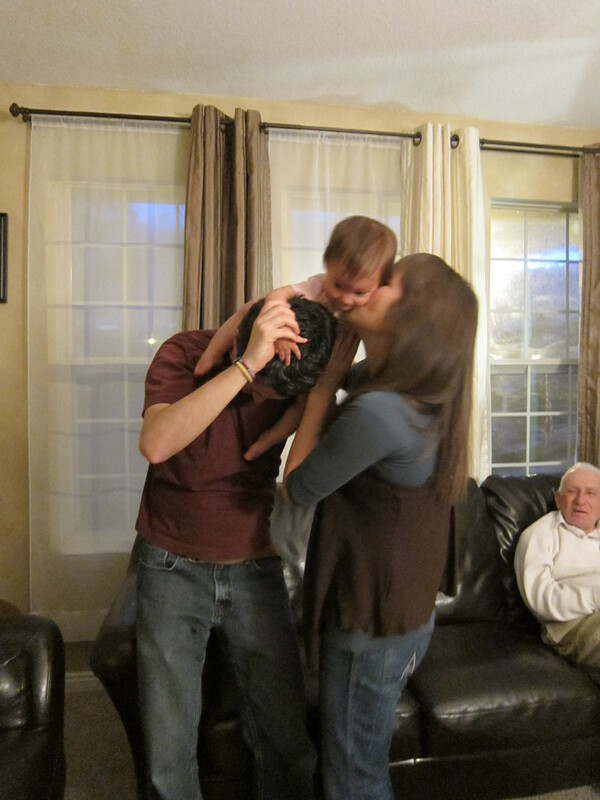 And that’s my baby girl and my hubby in the picture with me. Happy Birthday to me! And I promise that the next post will be a continuation of the Indian. My husband and I love Indian food! But it’s a recent love. Up until about a year ago, I don’t think we’d ever tried Indian, which is kind of strange considering I grew up in Washington and we lived there as a married couple for a couple of years, in an apartment complex that was over 50% Indian, maybe even 60-70%(we were right near Microsoft) and so there were lots of Indian food places close by. So anyway, last year Scott heard of an amazing Indian restaurant in the area from a buddy from work who is from India and we thought we’d give it a try and we’ve loved it ever since! It is so flavorful! We have some favorite dishes and I’ve been able to recreate a few things that we really like which I will share over the next few weeks. 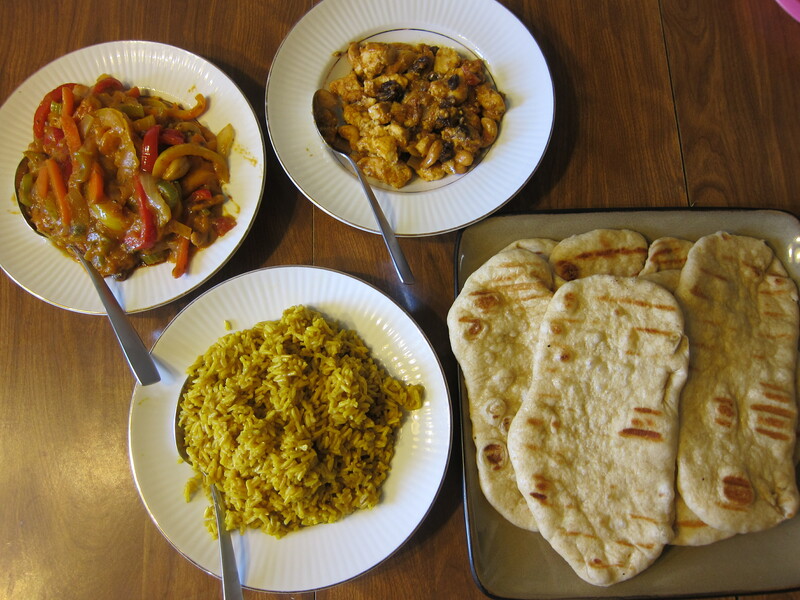 My kids inevitably always go for the rice and the naan bread. Two of our five children will put the sauce over their rice but the others are still very hesitant, though they’ll eat their mandatory 3 bites so they can have the naan bread. 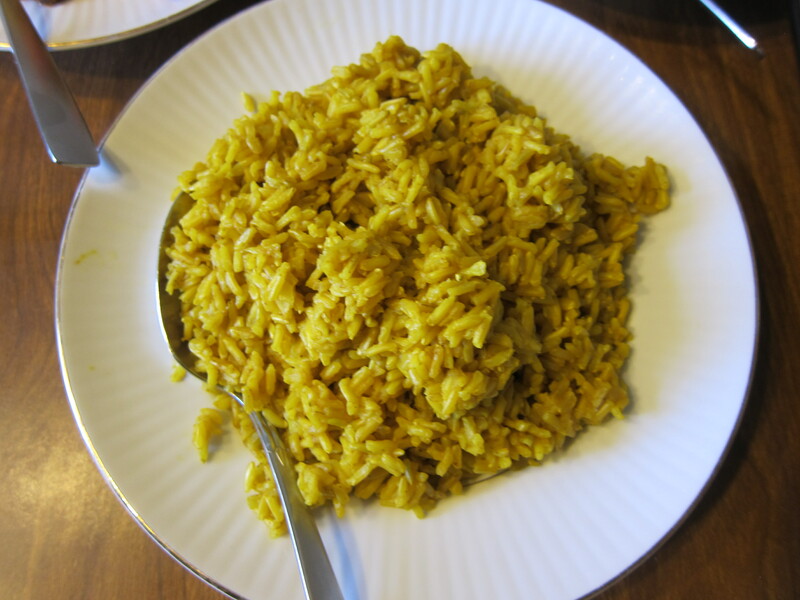 That being said, I would like to share our brown Basmatti Indian rice recipe with you today. There’s a couple of different ways to do this: in the rice cooker, or the old fashioned way, boiling water and then adding your dry rice and spices. Brown rice cooks longer than white, so plan on making this an hour before dinner, or, if you have a rice cooker like mine, you can make it much earlier on in the day and set your delay timer so that it’s ready when you need it. Combine all ingredients in rice cooker and cook according to cooker instructions. Or if you don’t have a rice cooker, heat a medium-sized pot to medium heat on stove. Add water and bouillon and increase heat until water boils. Add turmeric, curry powder and rice and stir to combine. Reduce heat to low, cover and simmer for about 40 minutes or until all water is absorbed. Fluff with fork before serving. *You can use other types of rice like Jasmine, or you could use a white rice, but if you use a white rice, reduce the amount of water and cooking time to follow the package directions. *If doubling the recipe, you’ll need to increase the cooking time to around an hour when cooking on the stove. Watch the rice near the end and once the water is absorbed, it’s done. Serve with Massaman Curry and Naan bread.